Tridan International, Inc. provides heat exchanger production machinery to manufacturers worldwide. Heat exchanger manufacturers looking for durable machinery that will provide decades of dependable operation, choose Tridan. We know that our customer service and support is the key to our customer’s satisfaction. In today’s competitive environment, it is important to have machinery that has the strength to withstand the forces of daily production. Tube expanders for example, can have a heavy-duty, high volume schedule. In other applications, the semi-portable Flexpander tube expander for coils may better serve the manufacturing environment. Regardless, Tridan’s strength and quality help customers maintain a reliable flow of accurately produced parts. We offer a wide range of machinery and tooling for Fin Stamping, Coil Expansion (tube expanding), and Tube Fabrication applications such as Cut to Length, Hairpin Benders, Return Benders, End Sizers and Braze Ring Loaders. One of Tridan’s newest and most successful offerings is the Model CHE Servo-Powered Cellular Horizontal Expander. It is designed for the simultaneous tube expansion and final belling of all tubes within small to medium sized coils. Its PLC control system allows for very precise, fully-automatic setup of varying coil lengths. 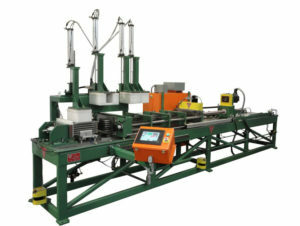 By simply choosing a coil model from a pre-programmed menu, the machine will automatically cycle the distance required. The setup for the coil width and height are manual, however, it requires minimal effort and time by design. The precision tooling and fixture features of the CHE reduces or eliminates the need to add or remove pattern tooling in the machine in order to accommodate varying coil sizes! The CHE horizontal expander uses no hydraulics. The tube expansion stroke is actuated by a very powerful and rugged servo motor that drives a precision high-capacity roller screw which cycles the expansion ram. The operation of the machine is very clean and exceptionally quiet compared to conventional hydraulic-powered expanders. Energy consumption is also reduced since the machine only consumes electricity when it is actively cycling. We are currently working on several new designs that will be made available to coil / heat exchanger manufacturers. Look for updates and announcements in the coming months and be sure to visit us at the AHR EXPO in January. Tridan’s factory and engineering center in Danville, Illinois is 130 miles from the worldwide distribution hub of Chicago, Illinois, USA.